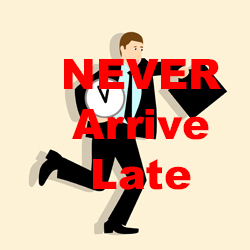 Carol Chapman- 1 & 3: NEVER Arrive Late! 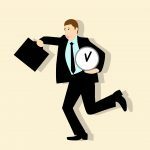 Carol Chapman- 1 & 3: NEVER Arrive Late! →1 & 3: NEVER Arrive Late! 1. Give yourself extra time just in case you get stuck in traffic. The last thing you need is to arrive with your heart pounding, because there was a traffic jam. Furthermore, you might get lost or might need to stop to fill up your vehicle with fuel. A bridge may open stopping traffic. So many things can happen that you wouldn’t anticipate. 2. Event coordinators get nervous too. They have a lot invested in the event. They’ve publicized it and may be afraid no one will turn up. They may also have their own issues with public speaking anxiety and feel nervous about introducing you. Don’t add to their worries. Arrive early. They’ll love you for it. 3. 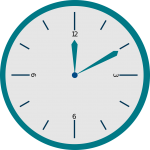 You will feel so much more relaxed and confident if you arrive early. Another reason to never arrive late: You will feel so much less nervous. If you aren’t feeling worried and embarrassed because you can tell that you’ll arrive late, you’ll feel calmer. You’ll also have time to set up and meet people in your audience—they’re usually friendly. Of course, sometimes you can’t help circumstances beyond your control. I remember I once turned left instead of right and ended up on a long wooden bridge over a swamp. You simply couldn’t get off the bridge until you came to the end of it, which took miles. As a result, even though I tried to never arrive late, I did. That’s how I know how it feels to get to the event much later than agreed upon. Another time, I didn’t realize I had crossed into a different time zone. What a surprise to discover that my it was an hour later than I thought it was. These things happen. Therefore, to the best of your ability, keep in communication with your organizers. To discover more public speaking skills and also, if you’re an author, how to sell more books by speaking, get Carol Chapman’s “Speak and Sell Books.” It’s an online video course at: CarolChapmanLive.com/Speak.